For control of undesirable vegetation in non-crop areas such as fence rows, highway rights-of-way, storage areas, non-irrigation ditch banks and under paved surfaces. 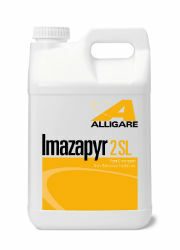 Imazapyr 2 SL may also be used in grass pastures and rangeland, and for establishing and maintaining wildlife openings, except in the state of California. DO NOT contaminate water when disposing of equipment washwaters or rinsate.